Maybe I’m jinxing things, but the weather has been pretty wonderful here. Not too hot, and perfectly sunny everyday. It’s significantly easier to be in a good mood when you don’t need two showers a day to avoid major stinkage. Thus, today’s Like A Picture captures the gorgeous summer sunlight we’ve been enjoying, even if (especially if?) it does look like a page out of an Anthropologie catalog. As much as I may be a born-and-raised city kid, even I can’t deny the appeal of a lush outdoor space like this. Anybody else want to meet me for a drink out here? I’ll bring the mosquito repellant, you bring the gin. Ignoring the fact that the candle is actually Christmas-scented (weird), it looks like a tree (it is from a company called Baobab, after all) and plays well with the picture. The blanket is from West Elm and has a nice ombre tone going on, which mimics the light streaming in through the trees and the light and dark leaves. I am majorly in love with the tablecloth and those chairs; it’s all very French Provincial to me. Do you have an outdoor space where you live? A backyard that perhaps looks like that? Can I come over? All we have is a gated alley where we keep our trash. Ah, city living. I see you left your fedora on the chair. You would not believe how many of those chairs there were at the antiques fair. hundreds and hundreds, mainly white. And the metal topped tables. I was seriously craving a garden. I have a balcony which has a bistro set on it, it’s just about large enough to sit out on but the doors open outwards so it’s really hard to get out on it which is super unhelpful. What moron designed those? This is pretty much my dream outdoor dining spot. I’m feeling all envious over Annie’s ability to find table and chairs like those so easily. Maybe I’m just not looking in the right spaces? The candle outer looks like an animal hide?? You’re on….design my backyard around the oversized grill and the potted plants! I’m down to meet you up for a picnic. It’s been raining here ridiculously and I’m ready for some sun! We’re lucky enough to have a reasonably-sized garden but boy, does it need a lot of work/maintenance! I’m looking into ways of making it chic yet low maintenance. Well, it took this post for me to realize that we have a backyard that we definitely don’t use enough. I remember city living and hoping against hope that we had a little outdoor space. Now that we have it, we just take it for granted. We’ve got a teak furniture set out there and a decent size patch of grass. You know, I think I’ll get the family to have a picnic dinner out there a couple of times this summer. (Because I’m crazy like that.) Thanks for the inspiration, Erin. More importantly, love this Like A Picture. I’m going to guess it’s somewhere in Italy or France. 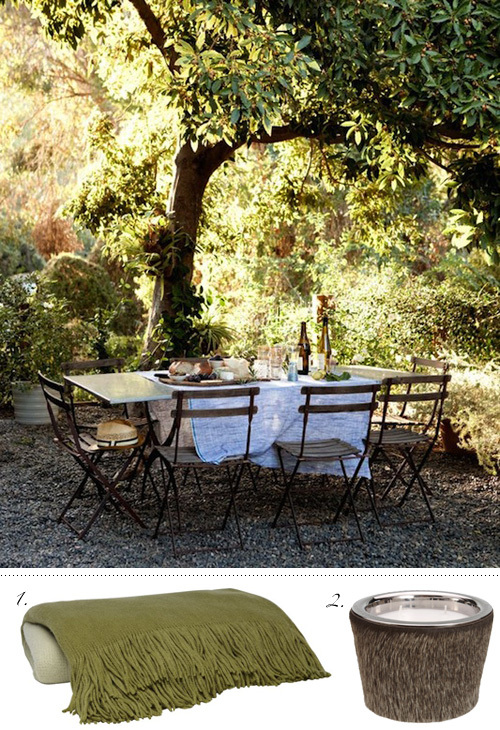 Love the washed linen table cloth.